The other problem is that writing a solver which doesn't generate long solutions is difficult, and solving takes a long time. 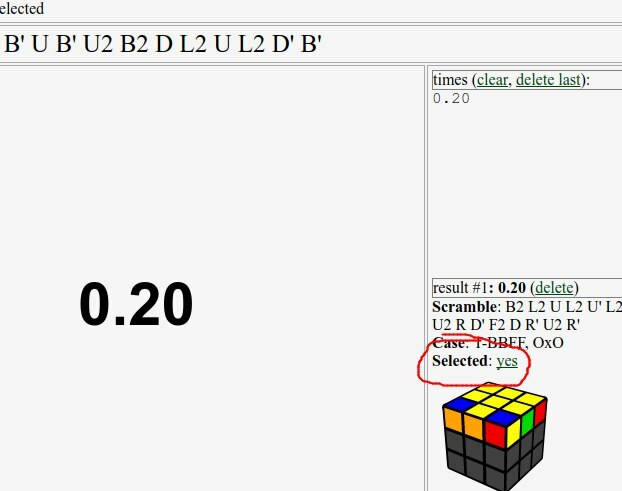 I don't want to solve the ZBLL sub1, wait 5 seconds for generating the scramble and then scramble 30 moves (30=10 random moves+20 optimal solution moves). If that could be fixed, that would be great. Cause otherwise i wouldn't use the site not that much anymore i guess. cause that gets really tedious. This is awesome Roman! The only downside I see is how it sometimes gives 2gen scrambles. This ruins recognition practice for me, because I can already narrow the case down to 72. Is there a way you can fix this? Other that that problem, this is perfect! Thanks all for your feedback and feature requests! I will handle some of them this weekend and create a repository on GitHub. Under "show suggested alg" could you also have "add your alg" ability. Thanks to @AlphaSheep, selected cases are now persistent. I think there's a little problem with the Pi case RFFL O/C. The oblique bar on U is in the wrong direction. A request: would you mind adding a way to change the colors? At least a second choice: black background + green letters. Thanks. I'll add color settings this weekend, for now you can use the dark reader - I have this turned on all the time. Thank you. More seriously, large white plages often hurt old eyes. Is it possible to save certain presets for case selection? For example, the user can make a preset that includes every case they know, and that will get saved. That way, if the user wants to only drill a set later on, their preset of all their algs doesn't get lost. Also, when I stop the timer, sometimes it starts again. Is it possible to implement a hold to start so this doesn't happen? This is very useful, thanks! I'm using it just for CMLL though, heh. I was about to suggest the exact same feature. Just note that if you're training your COLL, removing the single case won't remove other ZBLL cases from this COLL group. Hey Roman (kind of off topic), do you think it's possible in the future that you could make a 3style trainer? 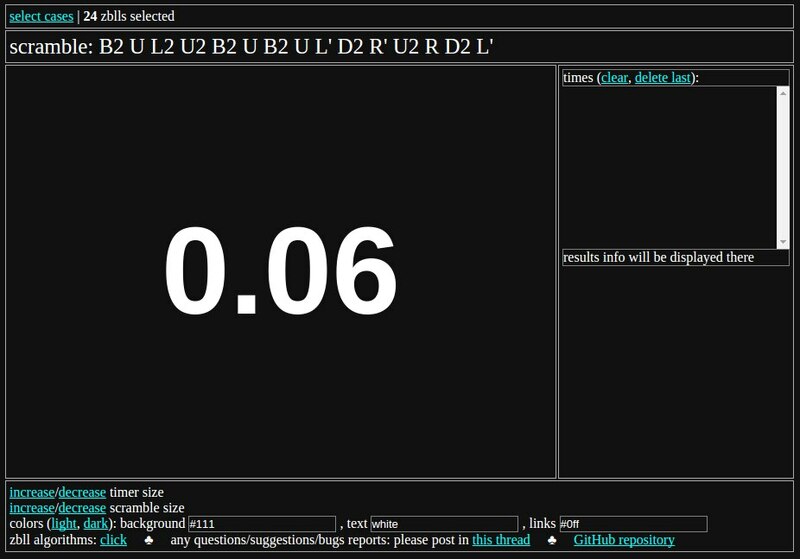 Where you select one target and then the 3rd is randomly generated? Love your work but this would make me love it even more. Long touch on smartphones doesn't select the timer label. In the selection page, would it be possible to have an option or something so it shows three sides instead of two? Because I recognize many of my ZBLLs by looking at three so it takes a little while to figure out which case is which while I'm selecting them. Great timer though, very helpful! !